Do not enable Ethernet and UART BT HCI simultaneously because they conflict on PTC16-17. The K64F SoC is configured to use the 50 MHz external oscillator on the board with the on-chip PLL to generate a 120 MHz system clock. The K64F SoC has a USB OTG (USBOTG) controller that supports both device and host functions through its micro USB connector (K64F USB). Only USB device function is supported in Zephyr at the moment. A debug probe is used for both flashing and debugging the board. 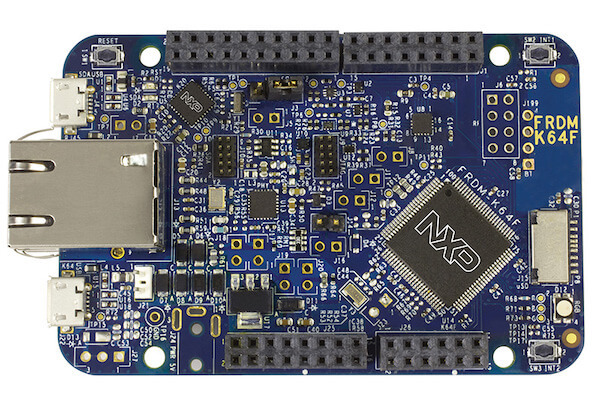 This board is configured by default to use the OpenSDA DAPLink Onboard Debug Probe. Early versions of this board have an outdated version of the OpenSDA bootloader and require an update. Please see the DAPLink Bootloader Update page for instructions to update from the CMSIS-DAP bootloader to the DAPLink bootloader. Install the pyOCD Debug Host Tools and make sure they are in your search path. Follow the instructions in OpenSDA DAPLink Onboard Debug Probe to program the OpenSDA DAPLink FRDM-K64F Firmware. Follow the instructions in OpenSDA J-Link Onboard Debug Probe to program the OpenSDA J-Link Generic Firmware for V3.2 Bootloader. Note that Segger does provide an OpenSDA J-Link Board-Specific Firmware for this board, however it is not compatible with the DAPLink bootloader. cmake -GNinja -DBOARD=frdm_k64f -DOPENSDA_FW=jlink .. Regardless of your choice in debug probe, we will use the OpenSDA microcontroller as a usb-to-serial adapter for the serial console. Connect a USB cable from your PC to J26.